Produktinformationen "Car Kulture DE LUXE Issue 86"
PRE 1968 HOT RODS-KUSTOMS-GASSERS-PIN-UPS-ART-KUSTOM MUSIC-ROD SHOWS!!. Check the cover shot of Shawn Killion's '28 Lincoln roadster (photo by Mike Basso). 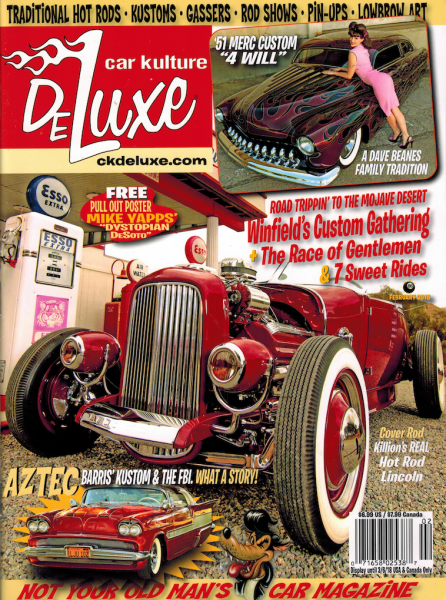 Also in side you'll find coverage of Gene Winfield's annual show, plus The race of Gentlemen, and a CKD exclusive feature on Barris Brothers' "Aztec," one of the most famous Barris kustoms ever! Weiterführende Links zu "Car Kulture DE LUXE Issue 86"
Kundenbewertungen für "Car Kulture DE LUXE Issue 86"